In Ayur Healthcare we have effective treatment for Hyperacidity and Helicobacter pylori infection. According to the science of Ayurveda the gastrointestinal tract is considered as the biggest metabolic channel giving external physical and chemical digestion. The balance of this metabolic fire gives balanceddoshas,(humours,vata, Pitta,Kapha). which in turn constitute a healthy functional body without disease. In hyper acidity the control and excessive secretion of gastric mucosa go wrong disturbing digestion. The amount of secretion by a gland is determined by The nervous System, The vagus nerve innervates and controls digestive system, the parasympathetic system stimulates digestion, the sympathetic system inhibits it, Thyroid hormones influence digestion and excretion in pathology significantly. All this shows that the tranquility of the controlling system or the vata system is of utmost importance in treating digestive ailments. In treatment the hypersecretions are dealt with treatment medicines which pacify Pitta responsible for enzymatic transformations.Detoxifying the stomach from poisons acquired from occupational hazards pacifying vata system . Treatment with Dhara helps to calm nerves involved in movement principle of digestion exactly aiming cessation ofpsychosomatic symptoms.The result of which is controlled acid secretion and establishment of good digestion. and bowel habits reconditioned. Dietary reigme which promote digestion and Calming the irritant etiology of digestive disease is achieved making it a promising treatment. In Ayur Healthcare the treatments under this peculiar psychosomatic associated diseases include:- Takradhara:- medicated buttermilk is prepared by an expert physician taking into consideration the humoral permutations of vata Pitta and kapha.associative in a patient .The oil to be massaged is also selected according to the body type and associative ailments.This treatment is highly Effective in chronic cases where Insomnia and nervousness play a synergistic role in hyper acidity. Shirodhara Dhara:-with medicated milk it is used especially in patients who cannot bear the cold of buttermilk. A diet is planned by the Ayurvedic Practitioner from the enormous treasure of applied dietetics explained in ayurvedic treaties for the well-being of the patient from within. This ensures avoiding relapse of symptoms and works in Synergy with shodhana or purifactory medicine. 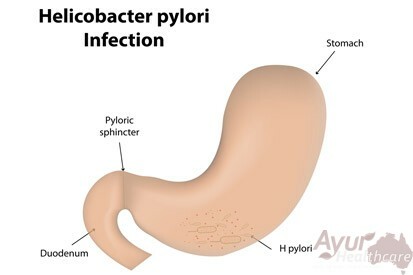 Infections of helicobacter pylori are dealt with medicine which have anti bacterial, viral and fungal activities,along with controlling hyperacidity .Thus controlling infection under reduced acidity .Diet with added spices which have antibacterial properties help. probiotic approach with buttermilk recipes help to establish favourable flora and fauna of intestine and giving healthy digestion.